The Peninsula is one of two buildings in Aventura found to the east of Biscayne Boulevard in a location that's quiet yet serenely scenic. The 31 story Peninsula overlooks the waters of Dumfoundling Bay to the east and also has a small commons next door to the west called Veterans Park. Collectively, it's one of the most tranquil buildings in the entire city and with 142 Aventura condos for sale, you're sure to find a unit that suits your needs and lifestyle. The lighted tennis courts complement the Peninsula's fitness facility and since there is also a fitness trail, you have multiple options when it comes to choosing how to stay active. The card and billiard room provide a great way for Peninsula residents to socialize and relax, assuming you aren't taking your dog for a leisurely stroll since Peninsula is pet friendly. The units of Peninsula have 2,970 to 3,620 square feet of living area and come with marble bathrooms as well as large walk-in closets and granite kitchen countertops. Head up Biscayne Boulevard and visit the fifth largest shopping mall in the United States, better known as Aventura Mall. If you keep heading north from Peninsula you'll eventually find the city of Hollywood in Broward County which has beaches and a popular downtown area full of restaurants, bars and much more. 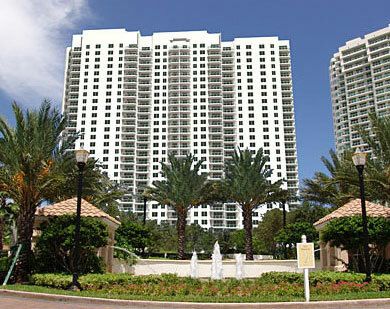 Sunny Isles Beach is across the water to the southeast of Peninsula.